Philips creates an all-in-one software solution which lets you decide for yourself how you want to work, with SpeechExec Pro Dictate LFH-4400, for efficient workflow management. 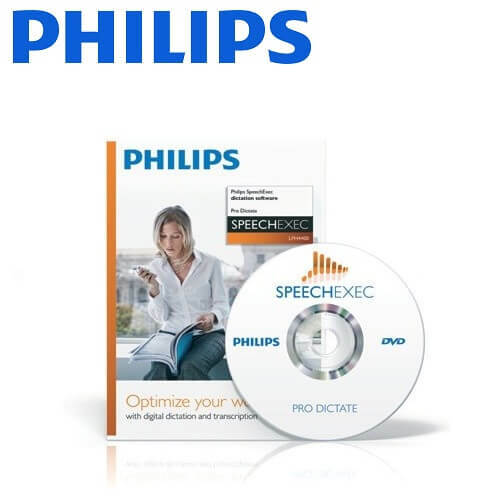 Designed for busy professionals and tailored for the Philips SpeechMike range, SpeechExec Pro has automatic file download via USB for quick transcription and priority setting to ensure those urgent recordings are flagged and processed first. Organise your dictation workflow with SpeechExec Pro software, with real-time job status info which tracks the flow of dictation files and resulting documents between author and transcriptionist; includes automatic download so when you plug in your dictation device your audio files are automatically uploaded directly onto your computer and into SpeechExec and optional automatic backup function to protect your data against accidental loss. Compatible with Dragon NaturallySpeaking speech recognition software (available separately); and featuring DSS Pro encoding for optimised voice recording, file encryption and secure file transfer.